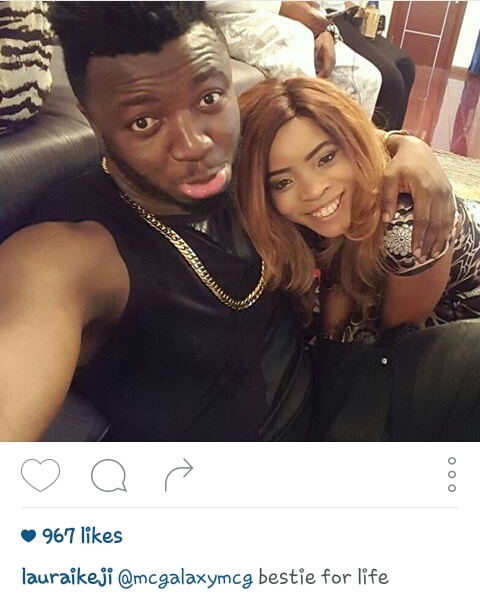 MC Galaxy and fashionista, Laura Ikeji, who is also the sister of popular blogger Linda, had always been close. At a point, the singer gifted Laura N1m and this made many people raise an eyebrow.Many opined that the two were an item till the fashionista shocked many as she got married to her long-time boyfriend, Ogbonna Kanu, younger brother to the legendary footballer, Nwankwo Kanu. When asked why the pop singer did not marry the lady he terms as his best friend, he simply said, “Laura had always had a boyfriend for a very long time and I knew but other people did not know about it. Probably if she did not have anyone in her life, I would have asked her out because we really connected and we were best of friends. He added that there was never a time they dated because he saw her as his sister, “There was nothing between Laura Ikeji and I. She is not just my best friend but I refer to her as my sister because she knows about everything that I want to do. If I listen to her advice, everything works out fine and I consult her before I sign some artistes. . If she tells me not to do so, I listen to her because she is very intelligent. If she talks to you and you listen, you would make it. The reason my brand is big today is because of Laura. I was not used to granting interviews but she advised me that I need it. I am just lucky and blessed. As a smart guy, if you have such a person as a friend, you have to keep them as friends because the moment you mess it up, things might go sour,” he said. 0 Comment to ""The reason my brand is big today is because of Laura Ikeji "- Mc Galaxy"